As it emerged the Tories had won a majority government at last week’s general election and mansion tax fears subsided, wealthy investors went on a buying spree in London’s luxury market. It was reported that more than £100m worth of prime property was sold on the following Friday in a buying frenzy that kept estate agents working into the night. Peter Wetherell, chief exectuvie of Mayfair estate agents Wetherell said: “I’ve had correspondence last Friday and over the weekend with some 70 clients and other property contacts and all of them have said to me that the luxury London market is now ‘back in business’, especially with the mansion tax and the non-dom worries now blown out of the water due to the resounding win by the Conservatives”. “If Friday is any indication we will now see a big wave of previous pent up demand unleashed in the London housing market, which will lead to a rise in new instructions and sales across London and the Home Counties in particular, especially in the premium sector of the housing market,” he added. The wave of renewed interest in London’s high-end real estate has sparked concerns that the capital’s house prices will continue to rise, despite increasing affordability issues at the cheaper end of the market. Leading research consultancy Oxford Economics recently revealed that the average cost of a home in London is on course to breach the £1m by 2030. This incredible projected price growth is set to be the consequence of housing supply struggling to keep pace with a rapidly rising population. The report also warns that affordability issues will be intensified further if the expected price growth coincides with a continued widening of the gap between rich and poor. London Mayor Boris Johnson predicted last year that by 2036, London’s population will have increased from 8.5 million to 10 million. However, Oxford Economics say Johnson has been too cautious and they forecast population growth closer to 11 million in England’s capital city. The last two years has seen market disparity emerging between London’s property market and the rest of the UK. 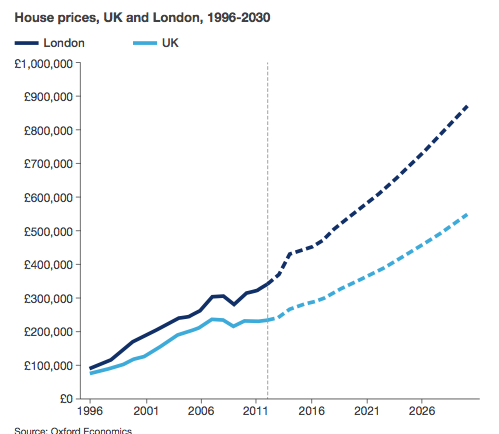 According to Oxford Economics research even using cautious assumptions, house prices in London are likely to double in the next 15 years. London’s prime property market has gathered pace relentlessly over the last two years without showing any signs of slowing. The majority of investment is at the luxury end of the market although the ripple effect has made most of London’s residential property inaccessibly expensive. With economists predicting a potential doubling of property prices over the next 15 years, many experts believe it’s only a matter of time before the market overheats completely. It’s difficult to see where even the wealthiest investors are getting their returns in the current climate and perhaps that is an indication that in many cases buying criteria has less to do with profit and more to do with the anonymity the ultra-wealthy are afforded as owners of UK real estate.